Surfing used to be a pursuit for the elite, an underground obsession or a time-waster for the hippy soul surfer. But now surfers are everywhere – they’re getting younger and they’re getting older – even us mums are getting into it. Riding waves is so mainstream that it was recently given inclusion in the 2020 Summer Olympics. But even if you’re not looking to go ‘pro’ surfing can be such a great way to get fit, enjoy the outdoors and possibly pick up a hobby that will stick with you for life. With lessons in Bondi and Maroubra, Let’s Go Surfing cater to every level of surfer, from the complete novice to those who want to hone their skills. They even have a mother’s group called Women on Waves which is a six week course designed to get women in the water, make new friends and build confidence while catching waves on Bondi Beach. For kids there are loads of options, from one-off lessons to give them a taste to after-school programs that will guarantee to get them up on the board, even holiday surf camps where they can really master their craft. Kids can even start from as young as 5 in the Weet-Bix Groms where they’ll also learn beach safety and awareness of rips and tides. Probably not the first place that comes to mind when you think about becoming the next Kelly Slater, but Wet n Wild Sydney do offer surfing lessons for kids and adults. If the ocean is just too frightening for you, this is the next best thing. The wave pool is a safe, friendly environment with small waves for you to gain the confidence and technical skills required to ease you into surfing. For mums who are worried about making a fool out of themselves, the Ladies Go Surfing package is for you – with a group of likeminded people you’ll be helped onto the uncrowded pool waves by the qualified instructors and getting up in no time. A great way to really get into surfing is to go on an intensive surf camp. Australian Surf Tours do two-day weekend camps for adults where everything is taken care of – you just jump on the mini bus and they’ll take you to some secluded spots on the south coast for lessons and camping. For kids, in the school holidays they do 3 day/2 night surf camps aimed at engaging your kids with nature and the ocean (parents can go too and spend the whole time lying in hammock if they want!). 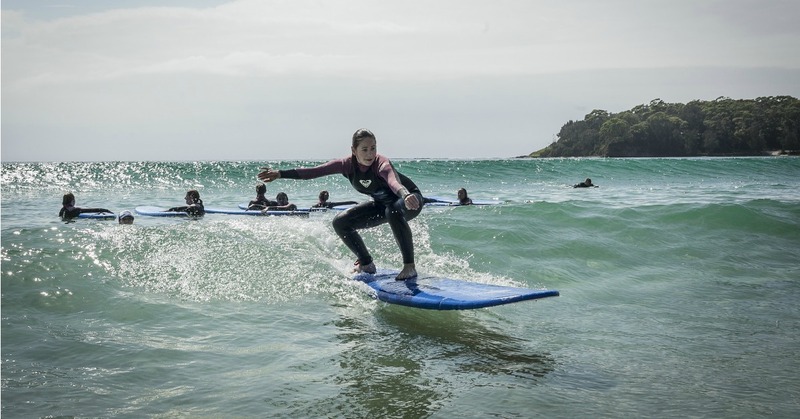 But because they don’t really want the mums to miss out on all the fun, the company introduced Mums Go Surfing groups that bring women together and give them a chance to learn something new just for themselves. We think that’s a pretty important thing for mums! One of the longest running surf schools in Sydney, Manly Surf School have been teaching people to surf on Manly Beach and all the way up to the northern beaches since 1983. They run lessons every day, several times a day and always know the best places to score waves. Lessons range from private, group, holiday programs to camps and start from as young as five years of age. They do birthday parties for up to 40 kids too – how cool! They also do stand-up paddle board lessons if you think that’s more your style of wave riding. This Shire surf school is host to the national program for 5-12 years olds, SurfGroms. A unique and fun program designed as an intro to surfing; ocean awareness and beach safety. Kids take part in an 8-12 hour program that will have them ripping up waves and feeling confident in the ocean. Cronulla Surf School also do before and after school lessons because they know down here that surfing is a lifestyle, not just a hobby! Could Surfing Be Banned At Bondi?